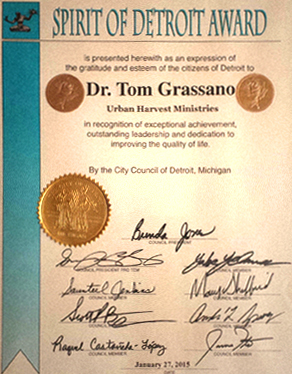 Spirit of Detroit Award is presented herewith as an expression of the gratitude and esteem of the citizens of Detroit to Dr. Tom Grassano in recognition of exceptional achievement, outstanding leadership and dedication to improving the quality of life, by the City Council of Detroit, Michigan. We are in discouraging times in our nation. Our people are divided. Our efforts seem to have been futile to bring hope and change. But YOU Oh LORD are always able to bring hope and change. As You said in Your Word, where two or three people are gathered together believing in Your name, we can ask and our prayers will be heard. We ask for You to bring healing and unity to this nation, for You to heal wounded hearts, for You to crush the divisions that lie between us, and for You to use us, leaders appointed by Your divine plan, to be agents of healing, unity, and hope to our city and our nation. We know that YOU, LORD, are the One and Only True God. We know that YOU care about every detail of our lives. We know that YOU are the Only One able to bring peace, so we look to YOU for our help. 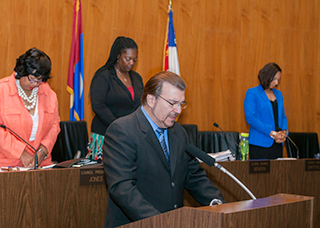 We ask You to bless this body – this Council of City Leaders. Give them unity. Give them wisdom. Give them open ears to the wounds in our city. Give them insight and plans that are not of their own making, but are from YOU, Oh LORD. And as we see successes in our city, as we see hope on the horizon, as the wounded hearts of our citizens are healed and joy returns to their lives, may YOU ALONE be the One who is glorified! For only YOU are worthy of praise. Thank YOU GOD for what you are doing this day in our city. Thank YOU for this council of leaders. Bless them. Bless their families. Bless their homes. Bless their health. And guide their decisions in accordance with YOUR Divine Will. May Your heart and Your truth have a prominent place in this governing body. This we pray in the Name of JESUS CHRIST, our SAVIOR and SOVEREIGN LORD. 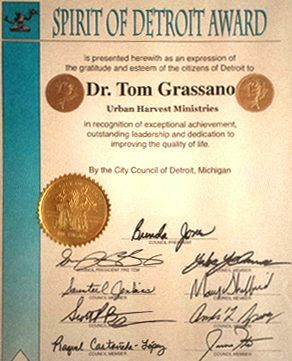 In 2005, Urban Harvest Ministries expanded to Detroit and established Hope for the City, an initiative uniting the body of Christ to reclaim communities and pastor the streets again. The book Detroit: An American Autopsy states, “ … redemption is thin on the ground in this ghost of a city,” but that has not been the case for UHM. Building on years of experience in the South Bronx, the Hope for the City initiative is empowering the church in the Great Commission in the urban context, leading in outreach, establishing prayer initiatives, equipping leaders, and building networks across racial, denominational, and economic barriers. As of 2015, Hope for the City is working in twelve communities in Detroit and has led over 100 outreaches this year, resulting in hundreds hearing the Gospel.